NBA in Okc - Yes or No? Of course, no one knows whether Oklahoma City will come to get an NBA team, be it the Hornets, the SuperSonics, or anyone else. But, sports columnists like to guess. Here's a couple of takes this past week. The links are: Doyle article and Whshynski article, but the articles are below for your side-by-side reading pleasure. NBA groupie Oklahoma City will get its heart broken by the SuperSonics and Hornets, and the only people who don't know it are those who live in Oklahoma City. At the moment Oklahoma City looks good for an NBA franchise by 2008, whether it's the Hornets, who adopted OKC as a second home after Hurricane Katrina leveled New Orleans, or the Sonics, who were purchased last week by an OKC group. Well, looks deceive. So do professional franchises and owners and leagues, all of whom use one city against another. In this scenario OKC is the city that's going to get used. With history for bifocals, you can see Oklahoma City's depressing destiny from a long way off. The innocent folks of OKC? They can't see anything. They're too close to the situation, too involved, blinded by lust. Charlotte knows that lust. So do Tampa Bay and Washington, D.C.
Oklahoma City boosters will tell you they're different than jilted cities of the past. That they're close, so close, to getting an NBA team. The Hornets look good, considering New Orleans didn't support the team before the hurricane and can't support it now, and considering OKC fans bought more than 10,000 season tickets when the Hornets hastily moved there this past season. The Sonics look even better, considering their new ownership is led by an OKC businessman, Clay Bennett, who has been trying for years to bring home a major sports franchise. One way or another, the NBA is coming to Oklahoma City. That's what OKC boosters believe. Last week Oklahoman columnist Berry Tramel wrote, "OKC suddenly has two quarterhorses in the derby, and its permanent NBA chances never have been better. Hornets or Sonics, one or the other, almost surely will be Ford Center tenants beyond next season." Given what you know about the situation in New Orleans and the ownership in Seattle, that sounds reasonable. Almost surely the NBA is coming to Oklahoma City. It took T.B. more than 20 years to field a team the AL East can use as a whipping post. Then again ... when it comes to a city's pursuit of a sports franchise, "almost surely" will almost always get your heart broken. Look at Tampa Bay. Yes, Tampa Bay got its Major League Baseball team, but don't forget the torture it endured before winning the expansion Devil Rays. When Tampa Bay investors agreed to buy the Minnesota Twins in 1984, commissioner Bowie Kuhn nixed the deal. In 1985, Tampa Bay investors agreed to buy the Oakland A's for $37 million; Oakland backed out of the deal. In 1987, Tampa Bay went after the Twins again, agreeing to buy the team for $65 million. That deal crumbled during further negotiations. In 1988, the Chicago White Sox came so close to moving to Tampa Bay that team employees were polled to see who would move South with the team. Although 60 percent said they'd move, the White Sox stayed put. Along the way, St. Petersburg built a $130 million stadium to turn its annual MLB flirtation into marriage, with 22,000 season tickets spoken for. In 1991, baseball rewarded Tampa Bay diligence by giving an expansion franchise to ... Miami. In 1992, St. Pete tried to buy the Seattle Mariners, but the Marlins helped throttle that by citing their need for in-state exclusivity. Later in 1992, San Francisco owner Bob Lurie agreed to sell the Giants to a Tampa Bay group, but NL owners veoted the deal. This could be you, Oklahoma City. You also could be Washington, D.C., which lost its MLB franchise in 1971 and spent 34 years trying to get one back. In 1973, a D.C. group agreed to buy the San Diego Padres, even choosing Frank Robinson (strange but true) as the team's next manager, but had to give the franchise back after failing to close the deal in three weeks. In 1976, baseball expanded not to the nation's capital, but to Toronto and Seattle. In 1991, with Washington, D.C., again on the list, baseball grew to Miami and Denver. Baseball is back in RFK Stadium -- after a 34-year hiatus. In February 1995, Major League Baseball described Washington, D.C., as "a very viable candidate for expansion." Two weeks later MLB awarded teams to Tampa Bay and Phoenix. Later that year, a Washington, D.C., group agreed to buy the Houston Astros for roughly $150 million, only to have commissioner Bud Selig squash the deal. If you're NBA groupie Oklahoma City, you're comforted that Tampa did finally get its expansion team, and Washington, D.C., did finally get the Expos. But compare those cities to OKC. No comparison, know what I mean? The sunny Tampa Bay market beats the crap out of dusty OKC. Washington, D.C., is one of the leading cities in the world, while Oklahoma City is one of the leading cities in Oklahoma. So what'll get between NBA groupie Oklahoma City and its NBA team? No clue, but it'll be something. The Hornets and Sonics have several years left on current leases, which give their cities time on arena and infrastructure issues. The NBA could decide not to let either franchise leave its internationally known city for OKC, which would be the smallest, least diverse market in the league. Boll weevils could destroy downtown OKC. This is not a painless process. Charlotte knows. Charlotte has been linked to almost every small-market franchise in baseball, with Minnesota Gov. Arne Carlson once glumly predicting the Twins would become the Charlotte Twins. Didn't happen. Charlotte got so abused by baseball that earlier this year, when the Marlins announced plans to explore other cities and mentioned Charlotte, Charlotte basically said not to bother. Charlotte has read this book, many times, and knows how the story ends. Could someone please send the book to Oklahoma City? Oklahoma City only knows what NBA owners are telling it. Which means Oklahoma City doesn't know anything. Ed. Note: Emphasis supplied by me. It's as stereotypical as rain-soaked months and flannel shirts tied around the waistbands of jean shorts, but the fact remains that the good people of Seattle consume an absurd amount of coffee. Coffee bars, coffee shops, coffee in the hotel lobby, coffee at the gas station - and all of it good. I'm not even sure they sell instant coffee at the supermarket; it'd be like stacking cans of Chef Boyardee in Sicily. There are even these bizarre little huts in strip mall parking lots that sell grab-and-go espresso. Until I visited the city recently, I had no idea how much coffee there actually was in Seattle. I haven't seen this many beans in one place since I went to Lilith Fair with my ex-wife. Seriously, coffee in Seattle is as prevalent as crack here in D.C., if crack were made of guns. The crux of this crisis for Sonics fans is KeyArena, a rusty '62 Chevy that was given a fresh coat of paint in 1995. Howard Schultz, the venerable Starbucks chairman-turned-Sonics owner who just stabbed his hometown franchise in the back for $350 million, claimed the arena needed $200 million in upgrades in order for the debt of that previous renovation to be eased and for the Sonics to eradicate some of their annual loses. "Upgrades" of course meaning the kind of high-price amenities that will lure new-money techies into luxury boxes while the plebeians fight over $7 hot dogs. There's no question the Sonics get killed on their lease, having to split suite and concession revenue with the city. Schultz claims his ownership group has lost more than $60 million since purchasing the Sonics and the WNBA's Seattle Storm for $200 million in 2001. But what he really lost was the bet he made with the city: that Seattle taxpayers would pony up for arena renovations like they did for a new baseball stadium and a new football stadium. 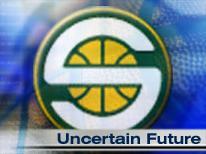 That keeping the Sonics in Seattle was as vital to the community as securing the future of the Seahawks and Mariners. It was a major miscalculation, further intensified by a change in political climate. You know you're fighting an uphill battle when the president of your city council tells Sports Illustrated that the Sonics' cultural value was "close to zero." But what drove the Sonics to Oklahoma City ownership might actually keep them from moving to OKC. The scenario is clear, if a bit danced around, by the new owners: settle on a new lease with a renovated arena in 12 months, or the team relocates to cowboy country. Bennett and his group are businessmen. If the city antes up a sweet deal that knocks down debt and increases team revenues, there's a chance the Bennett group might take it, especially if the New Orleans Hornets somehow end up permanently staying in OKC (not likely, but more on that later). Even if the owners turn down a sweetheart deal, the NBA could step in and reject relocating the 39-year-old franchise (again, not likely, but possible). Oh, and forget this whiff of a column by Gregg Doyel of CBS Sportsline, arguing that Oklahoma City is just a bargaining chip in an arena negotiation. He uses arcane examples from Tampa Bay's and D.C.'s frustrating history of near-misses with MLB franchises but completely misses the undeniable differences here: that the Sonics have actually been sold to a local owner from Oklahoma City, and that OKC has proven - unlike Tampa Bay when it headhunted any ball club that would fit its boondoggle stadium - that it can enthusiastically support an NBA franchise. This is no bargaining ploy: the Sonics should work on their lassoing skills because they're headed to the ranch, son. I've been told Clay Bennett is a man of his word, which is pretty easy when your words sound like this: "We intend to honor the lease. We just need to work through that as part of a global solution to the overall effort." A quick spin of the Okie decoder ring, and that's translated as "just be happy we're not taking the Space Needle with us." Oklahoma City is going to have an NBA franchise in two years, and it's either going to be the Seattle Supersonics or the New Orleans Hornets. The former is a slam dunk: owned locally, stuck in an antiquated arena with an unfavorable lease and a hostile political environment. The latter is a bit trickier: the Hornets have already been embraced by Okies, will play part of their home schedule there next year, and weren't exactly "Les Mis" when it came to moving tickets at the box office in the Big Easy. David Stern has said they'll return to New Orleans because he has to say things like that when Hornets fans are still rebuilding their Katrina-ravaged lives. But tragedies pass and institutional guilt subsides...or am I the only one waiting for the New York Super Bowl Tagliabue spoke about post-9/11? 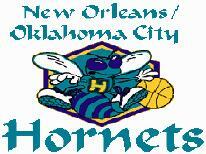 There is another scenario, however: the Sonics go to OKC, and the Hornets relocate to KC for the 2008-09 season. Kansas City's Sprint Center is scheduled to open in Fall 2007. Like the arena in Oklahoma City, it's part of a multi-million dollar revitalization campaign that's missing just one thing: a team of its own. If the NBA decides the local owners should be able to lay claim on OKC, and New Orleans is deemed unsuitable for the transient Hornets, Kansas City could be an NBA city following the NBA's all-star swan song in New Orleans in 2008. "I always think it's interesting how people in Seattle have negative attitudes toward basketball, which is dominated by black players and appeals more to the black community, while we look kindly on the Mariners and Seahawks, which draw more of a white audience. Yet another example of institutional racism, don't you think? [City Council President] Nick Licata should think about that." Like I said, I'll let that comment stand, only to add that there are three professional teams in Seattle: two with brand new stadiums, and one headed for Oklahoma City. What's clear about the Sonics is that they are the third team in that three-team town. Seahawks gear is everywhere, from the racks in tourist clothing stores to the backs of local fans. Mariners baseball is treated with a reverence and fervor I didn't anticipate, until I thought about all of those hours logged watching the Griffey teams and the Ichiro teams. There's a generation that grew up with this franchise, and a generation behind that one that still supports it. Then there are the Sonics. I didn't see a single person walking around in a Seattle jersey while I was there, and it was about 90 degrees outside. I didn't even see one at the NBA Experience fair held last weekend in the shadow of the Space Needle - save for the prop jersey the NBA provided to the carnival barker/DJ at the event. Another telltale signal: the bars don't have Sonics signs in their windows, next to the neon ones for football and baseball. "Fan Enthusiasm" is a tricky factor in determining whether it's time for a franchise to move on because so much of it has to do with management and on-court success. The team drew over 17,000 fans a game from 1995-99, with an NBA Finals appearance sandwiched in there. From 2000-04, the team couldn't crack an average of 15,700 because it stunk like week-old Seattle salmon. But for close to 40 years, Seattle has been a basketball town, or at least a town with basketball. Oklahoma City has been one for one season, and a partial one at that. When the Sonics move - OK, for the sake of those poor caffeinated souls in the Northwest, IF THEY MOVE - there will be years of prosperity and years where there are more bulls at the rodeo than fans at the arena. Basketball's a lot like coffee that way: a good cup is addictive, but enough bad ones and you'll break the habit. Columnist Greg Wyshynski is the Senior Editor for SportsFan Magazine in Washington DC, and the Senior Sports Editor for The Connection Newspapers of Northern Virginia. Despite Doyle's obvious personal dislike for Oklahoma (else, why the cheap shots), maybe he is right? Maybe not. What will happen? We'll all just have to wait and read about it in the funny papers! Stepping away from the present-day NBA melodrama, I slide back into the sublime – this time reminiscing about the Toddle House (I don't know about Seattle, but this popular nationwide chain was in New Orleans, also, according to http://www.fudcourt.com/loupe009.html). 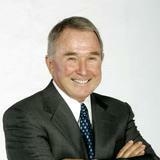 Toddle House was formed in 1932 by Fred Smith – his son Frederick Wallace Smith started Federal Express. As a sailor stationed on board the USS Mississippi home ported in Norfolk in the late 40's and early 50's I would stop at the Toddle House in Norfolk at the end of every liberty. On board our ship we were blessed with eating powdered eggs, for breakfast. My deal was eggs sunnyside up, sometimes 4ea and bacon. They cooked them in a small frying pan in butter then turning them out on the griddle then on your plate. The Toddle house saved me from starving for eggs for 4 years. When I settled in Oklahoma City, there was a little Toddle House on N. Walker about 12th Street. There I discovered chocolate ice box pie!! That was great. I miss the Toddle House. 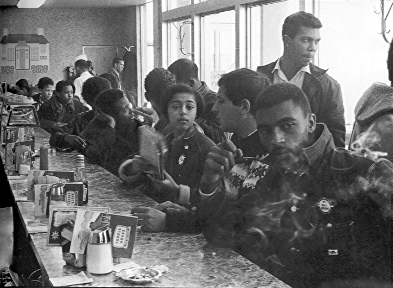 A Toddle House in Atlanta has the distinction of being occupied during a sit-in by some of the most effective organizers in America when the SNCC staff and supporters take a break from a conference to demonstrate. As far as I know, Oklahoma City's Toddle Houses were not the the setting of any civil rights sit-ins (but other restaurants were, a post for another day yet to come). When coming to Oklahoma City for those exhilarating debate trips during 1959-1962, not only did we stay at the Park-O-Tell and eat at the Lincoln Boulevard Chicken-In-The-Rough, when the debate trip destination was Oklahoma City University, we'd also partake of the fine food at the Toddle House diner located on NW 23rd somewhat near the OCU campus on the south side of NW 23rd. If you are lucky enough to be able to find them, the Vanished Splendor series published between 1982 (Vol I) and 1985 (Vol III) by Abalache Book Shop Publishing Co, Okc, written and assembled by Jim Edwards, Mitchell Oliphant, and Hal Ottaway (as to Vol III) are all incredibly helpful for learning obscure historic detail as to both images and facts. Sad to say, the books are out of print. But, Vol III of the series provides the only image I've been able to locate of this venerable presence of Toddle House in Oklahoma City. The “Toddle Houses” were a national chain of small cafes specializing in breakfast. Each tiny outlet was built to the same plan, and contained no tables, but merely a short counter with a row of stools. At one time there were three Oklahoma City locations: 1307 North Broadway, 329 Northwest Twenty-third, and 1221 North Walker. Former customers still remember the fluffy scrambled eggs prepared in a special way. Payment was on the honor system: customers deposited their checks with the correct amount in a box by the door on the way out. In business in Oklahoma City some thirty years, the Toddle Houses closed here in the 1960’s. Why is this Toddle House significant to me? The answer is simple – its Chocolate Ice Box Pie!!! Oh! If you've not had the privilege of letting this scrumptiously firm-but-creamy pie mesmerize your mouth's taste buds yearning for nirvana, you've missed out on one of the finer experiences (excepting, of course, your husband or bride, children and grandchildren) that you could possibly have had in this or any other lifetime! Well, maybe that's too much hyperbole, but you get my point. This recipe is for 2 pies (recommended); halve the ingredients for only one pie. • After the pies are cold, remove them and the whipping cream you've made from the fridge; spread the whipping cream over the top of the pies with a spatula; garnish the top, if you like, with curls of raw chocolate (use your potato peeler); cover with plastic or other wrap & stick ‘em back in the fridge. • Discourage your company from eating the pies; tell them it is not what you had hoped for, with profound apologies; later, when they're gone, eat the remainder or keep it in a safe place until you are ready to do so. Suzanne H. Chambers' request for Toddle House Chocolate Pie and Mrs. Harris' Pound Cake prompted a flood of responses from our readers. Judging by the dozens of letters we received, these two are among the favorites printed in the Winston-Salem Journal over the years. 1. Sift together sugar, cornstarch, cocoa and salt into bowl of mixer. On medium speed, add half the milk and mix thoroughly. Add egg yolks; mix thoroughly, being careful that mixture does not foam. 2. Place remaining milk in top of double boiler over boiling water. When milk is scalding hot, add chocolate mixture. Stir with wooden spoon and cook until the consistency of whipped cream is reached. 3. Put in bowl of mixer on medium. Allow to mix (just until combined). Cool. Add vanilla and mix for 5 minutes. 4. Cover with wax paper and completely cool before placing in refrigerator. Use 1 pound and 8 ounces of filling in each pie shell. Top with whipped cream. This should make 2 to 3 pies or more. I've not tried the above, being quite content with what I've achieved, but there it is for those that want it! I'll probably try it sometime. The following recipe for hash browns, requested by Charles Eldridge of the Zephyr community near Elkin, was sent in by Cheryl Dinkins of Yadkinville. Dinkins got the recipe from her stepfather, Bill Johnson, who used to operate the Toddle House restaurant in Winston-Salem. Dinkins said her stepfather told her that the secret is to use prebaked potatoes. 1. Bake potatoes. When done and cool enough to handle, peel and dice. 2. In a saute pan over medium heat, put about 2 tablespoons vegetable oil, or enough to prevent potatoes from sticking. 3. When oil is hot, measure 1 cup diced cooked potatoes, add them to pan and sprinkle with enough paprika to give them a nice color. 4. Flip and fry potatoes until golden brown. Serve hot with salt and pepper to taste. Once you've eaten of these sumptuous treats, you may well forget about the Okc-New Orleans-Seattle drama! In my initial blog post, I think I said something about this blog not having too many words but lots of pitures. Well, this post shows just how much Doug Dawg can be trusted cause this un's got NO pictures ... well, just "word" pictures! It's presumptuous of an Oklahoma City guy (especially one who's never even been to Seattle) to presume to "know" whether Seattle wants to keep its SuperSonics and Storm professional basketball teams. Here's a poll going on at HornetsCentral.com: http://www.hornetscentral.com/forum/viewtopic.php?t=3347. I'm reading that, on one hand, a group called, "Save Our Sonics and Storm" – see http://saveoursonics.org/ – has been formed in an effort to formulate a local groundswell to keep the teams, but, on the other hand, considerable resistance is locally present not only to discourage but to prohibit further public financing of projects like the Key Arena's expansion and updating. A fellow by the name of Chris Van Dyk has led petition drive for what is called "Initiative 91" to be placed on Seattle's November 2006 ballot. Van Dyk's group is called, "Citizens for More Important Things" and its website is http://www.citizensformoreimportantthings.com/index.html. The group has a pretty impressive list of supporters – see http://www.citizensformoreimportantthings.com/page5.html. And, here's the group's take on the history of the Key Arena – http://www.citizensformoreimportantthings.com/page2.html. Basically, should the local initiative pass, Seattle voters will be saying "No" to such public financing, and one would suppose that such vote would be tantamount to saying "No" to the opportunity extended by Mr. Bennett's Oklahoma City group. Van Dyk said members of his group love the Sonics, but they know the city of Seattle will get by if the new owners don't fork up the money. "We don't need the Sonics to be a world-class city," he said. "Oklahoma stockyards might need a little dressing up. We don't. We've got Mount Rainier." There are currently three different deal scenarios on the table, which Deputy Mayor Tim Ceis had offered to the old ownership group last May. The Sonics never formally responded to the offers, Ceis says. Ceis says those deals are still on the table for the Oklahoma ownership group: a $198 million renovation with a $49 million contribution from the team; a $149 million renovation with $37 million from the team (both of those would have to be approved by voters); and a $50 million renovation. Ceis said flatly he's not going to "go there" if Bennett's group tries to play Seattle off Oklahoma. "Nope, we're not doing that," Ceis says. It does appear that Bennett's group will play that card, though. A spokesman for Chesapeake Energy Corporation, whose CEO is one of the new owners, told the Seattle Times: "The people of Seattle have to make a decision about how important NBA basketball is to them. The people of Oklahoma City really fell in love with NBA basketball. [New Orleans played in Oklahoma City last season after hurricane Katrina displaced them.] There's a lot of people in Oklahoma that would be excited to have this team in Oklahoma City as well." Bennett's ownership group may be in for a surprise. The public is sick of subsidizing a private business that hasn't kept its end of the bargain. Indeed, our current lease is a bum deal for the city because we got stuck paying off the almost $74 million renovation we funded in 1995. Obviously, the Sonics were supposed to pay off the debt. Instead, we're paying $2.3 million a year (spiking at nearly $3 million last year) on a tab that's going hit about $130 million by 2014 when debt service is included. This may explain why the anti-Sonics-subsidy initiative cruised onto the ballot. "We sent a message that Seattle is not a socialist state," says I-91 co-chair Chris Van Dyk. "People don't want government subsidizing private business. They know that government doesn't pay their rents or leases. So why cover a guy who just cashed $50 million in stock options?" Letting the Sonics go is just the first step in saving Seattle. This fall, Seattleites will likely have a chance to vote on the public financing of sports franchises. It looks like Citizens for More Important Things has enough signatures to get their sports initiative on the ballot. I hope Seattle will take this chance to send a message to the amenity nuts: Unless there are tangible public benefits, such as a share of the profits, you can move your *** to Oklahoma City. So, it may well be that Seattle lacks community unanimity sufficient to respond affirmatively to the 12 month opportunity offered by Clay Bennett et al. 's Professional Basketball Club LLC. As an Oklahoma Citian who hasn't got a Mount Rainier, I'll (for one) say, "Sure thing! Let's work on getting our stockyards (well, at least, the Ford Center) all dressed up for the Oklahoma Centennial circa 2007!" What a fine way this would be to welcome in Oklahoma's 2nd century! If Seattle has to come to terms with providing a new facility (or expand the existing one) prior to October 2007 to meet the "clock is ticking" condition of Clay Bennett and company, what does Seattle need to agree to do (passing in this post upon revised lease requirements that are another part of the condition)? In 1983, the franchise was sold to Barry Ackerley, and for the next 20 years the team experienced many ups and downs (mostly downs). Under his threat to move the team, the City transformed the Seattle Center Coliseum, whose leaky roof led to the only "rain out" in NBA history, into Key Arena in 1993. 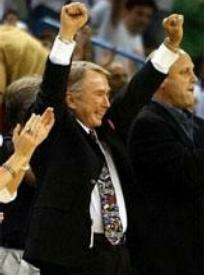 See http://www.dougloudenback.com/hornets/NBAarenas.htm for arena pics and capacities. In the context of this post, can/will the Key Arena be expanded (or a new facility be built) to place it at least in the middle of the pack, at or better than Oklahoma City's capacity? Toronto's 19,500 is presently "at the middle" (Okc's Ford Center is 19,163). Seating capacity does not only equal more ticket sales, it relates to concessions, gear, box seats revenue, parking, etc., which occur on game days, assuming that the team's contract allows all or a substantial portion of those revenues to flow to the team. But, that is a different topic, for another day. This post is only intended to cover arena capacity issues, if they are important. NBA in Okc - What's It Gonna Be, Boy? Remember the great song by Meat Loaf, "Paradise By The Dashboard Light", where the girl said, "What's it gonna be, boy?" Meat Loaf, though he pleads to the girl, "Let me sleep on it, I'll give you an answer in the morning," could not help himself and did NOT wait until the morning! So, What's It Gonna Be, Boy? With the 7/18/06 announcement that Clay Bennett's Oklahoma City group (Professional Basketball Club LLC: Clay Bennett, president of the investment firm Dorchester Capital, majority owner; G. Edward Evans, chairman of Syniverse Holding Inc.; Aubrey McClendon, chairman and CEO of Chesapeake Energy Corporation; G. Jeffrey Records, chairman of the board and CEO, MidFirst Bank; and Tom L. Ward, chairman and CEO, Riata Energy Inc.) had purchased the Seattle SuperSonics, war-time headlines, SONIC BOOM!, hit The Oklahoman's headlines. 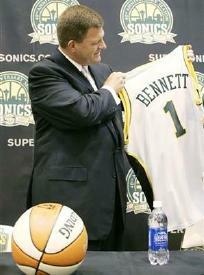 The thought, of course, was that Mr. Bennett would be moving the Sonics from Seattle to Oklahoma City. Schultz turned down higher bids from parties who wanted to immediately move the teams from Seattle. Bennett had publicly declared weeks earlier he was on a mission to buy an NBA team to play in Oklahoma City. But he agreed to honestly pursue an arrangement with Seattle and the state of Washington to secure a new arena and keep the teams in the region. To insist otherwise would have been a deal breaker. But the promise came with a deadline. If an agreement with the state and city couldn't be struck within 12 months of the sale's closing in October, Bennett would be free to move the teams to Oklahoma City. Mr. Bennett's reputation as a straight-shooter and a man of his word precedes him. Mr. Shinn's reputation is different – and haven't Hornets fans in both Oklahoma City and New Orleans experienced the difference by hearing sometimes outrageously different remarks in different cities. For several instances of that, see my "Hornets Oklahoma City Reader" at http://www.dougloudenback.com/hornets/HornetsMedia.htm. If the Hornets were not already a lock to return to New Orleans after next season, Bennett's group's pre-emptive strike in Seattle almost certainly seals the deal that the Hornets will go back to Cajun Country. And, in the end, whether the Sonics do move to Oklahoma City after the 12 month testing period which begins in October (assuming that the NBA owners then approve the ownership transfer), Mr. Bennett has also given Oklahoma City the opportunity to "sleep on it" and give the girl (whatever be her name) an answer in the morning – and perhaps avoid making a decision which we might otherwise have come to regret! Love the Hornets and their coaches? Damn straight, I do. I went to 29 or 30 games last season in the Ford Center and loved every minute – and I will do the same next season! But, that I can also fall in love again, I have no doubt. “Who are these that fly as a cloud?” was the appropriate Scriptural text chosen by the pastor of the First Baptist Church of Oklahoma City in pronouncing the Post funeral oration. Posterity, and loyal Oklahomans everywhere who honor his memory may well reply: 'These are they whose flights bear them into the unknown and to untried heights, ever doing with all their God-given might, even as Wiley Post, the things they want to do, to advance the boundaries of knowledge and the well being of humanity'." My excellent daughter, Mary, and my can't-get-better-than-that son-in-law, Brian, and family members had occasion to visit the cemetery today, remembering their precious baby, Ella Elizabeth, my granddaughter. She is laid to rest 35 or so yards from Wiley Post's grave. Being so close-by to Wiley, she's probably up there in those clouds with him, and, about that, I have no doubt at all! 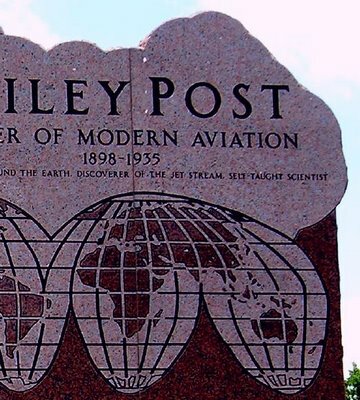 While there, I took these pictures of Wiley Post's Memorial to share with you. The memorial was funded and erected not too long ago by several in Oklahoma and Oklahoma City – sorry, but I don't have more detail just yet – I'll find out more and edit this post later as well as post more sharply defined images. For now, enjoy these pics taken today, July 22, 2006. 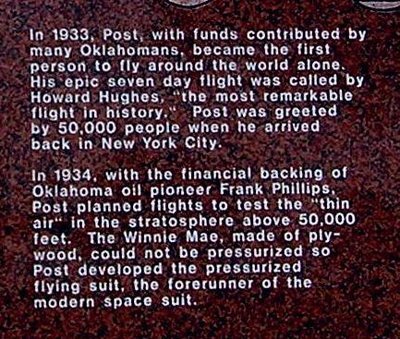 For much more about Wiley Post, see Wiley Post, An Oklahoma City Hero. Ed. Note 7/11/2008: I've just noticed that the links to the many images previously posted, from www.wileypost.com, no longer work. The organization's website is now here, but unfortunately the diversity of photos is not presently there. I've supplied alternative images where I've found them and will try to find more in the future. Also, see Bob Kemper's Taxi Strip website. Born near Grand Saline in Van Zandt County, Texas, on November 22, 1898, reared in south central Oklahoma after the age of 5, died in Point Barrow, Alaska, on August 15, 1935, buried in Memorial Park (on Broadway Extension south of Edmond) on August 23, 1935, many places can rightly claim to be the home of Wiley Hardeman Post, an Oklahoma aviation pioneer and hero. But, I’m quite certain that we can lay fair claim to calling him one of our own. Until July 1, 1931, the “speed record” for circumventing the globe was held by the Graf Zeppelin (1929 – 21 days). But, on June 23, 1931, he and his Australian navigator, Harold Gatty, left Roosevelt Field, Long Island, NY, in Wiley's Lockheed Vega named the “Winnie Mae” (for the oringal owner's - F.C. Hall's - daughter), determined to break that record. Traveling west to east, they made 14 stops along the way, and returned to Roosevelt Field on July 1, 1931, setting a new record of 8 days, 15 hours, and 41 minutes. The NYC Ticker Tape Parade is said to have rivaled Lindbergh's. A memoir by Wiley and Gatty, called, “Around the Word In 8 Days”, with an introduction by Will Rogers, chronicled their journey. But, some scoffed at the accomplishment because of his rural (south central Oklahoma) upbringing and lack of educational accomplishments (he dropped out of school in the 8th grade). So, he decided to take the trip again, this time alone, without a navigator but with some new equipment. On July 22, 1933, 50,000 people greeted him on his return to Brooklyn’s Floyd Bennett Field, having left only 7 days, 19 hours, earlier – breaking his previous record by 21 hours, and a 2nd Ticker Tape Parade followed in New York City. What we take for granted today was electric to those who lived in that time. 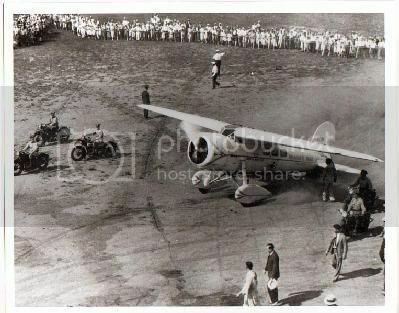 For example, see how Wiley Post was welcomed in Cleveland, of all places! 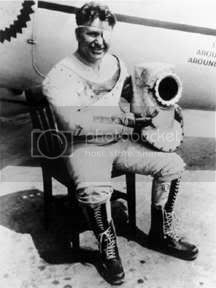 Wiley Post received the Distinguished Flying Cross (1932), the Gold Medal of Belgium (1934), and the International Harmon Trophy (1934). He helped designed the 1st high-altitude pressure suit and is credited with discovering the Jet Stream. He was enshrined in the National Aviation Hall of Fame in 1969. In 1979, the United States Postal Service honored him with two airmail stamps. 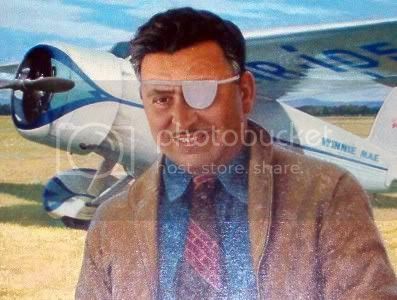 About him, Amelia Earhart said, "Wiley Post was the most courageous pilot in the history of aviation," Astronaut Gen. Thomas Stafford said,"Every time I donned a modern space suit, I thought of Wiley Post," and Howard Hughes said, of Post’s latter flight, "the most remarkable flight in history." Curtiss-Wright was also the original base for Braniff Airways (according to Kristopher Crook). "Braniff was based at Curtiss-Wright throughout the 1930's, maintaining operations at the field even after the opening of the Municipal Air Terminal (now Will Rogers World Airport) in 1932." In 1928, the Curtiss-Wright Corp., invested $115,000 for an airport on the north side of Oklahoma City. The 160 acre airport was heralded as “Oklahoma City’s model airport,” complete with a beautiful art-deco hangar and a fleet of Curtiss-Wright airplanes. 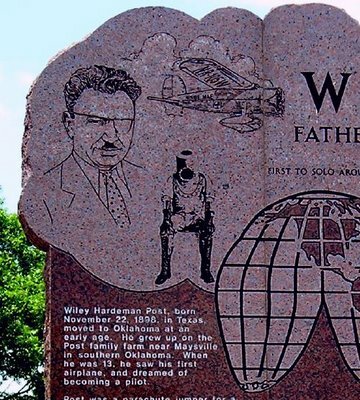 Oklahoma’s, world famous aviator Wiley Post, used the hangar extensively, from 1929 to 1934 to design and modify airplanes he used on several intercontinental and two around the-world flights. As one of the most distinguished pioneers in aviation history, his achievements comprised some of the greatest accomplishments in aviation. * * * From 1932 to 1937 the hangar was home to Braniff Airlines. 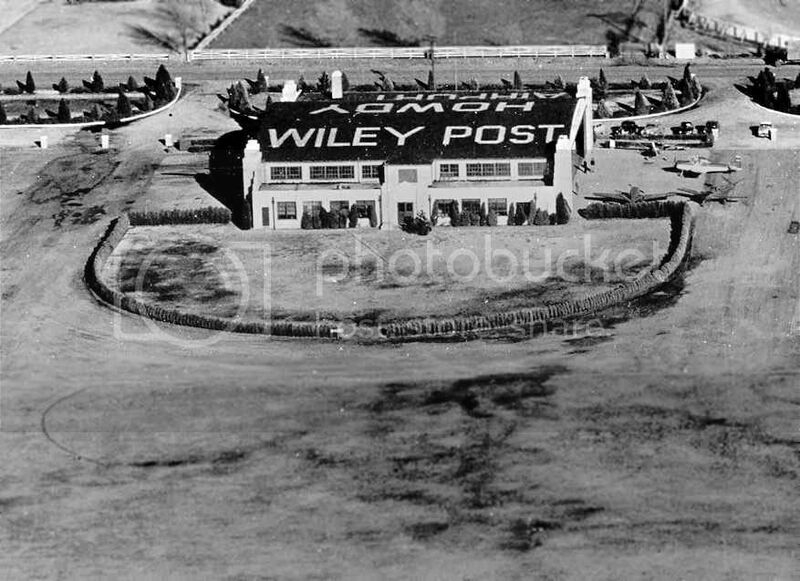 According to Jeff Wilkinson, Wiley Post Airport was closed in 1955. “I can imagine that what led to the closure was the nearby Tulakes Airport, built in 1942 as an auxiliary to the Army's Will Rogers Field located at the Oklahoma City Municipal Airport [Tulakes Airport eventually became known as the current Wiley Post Airport]. 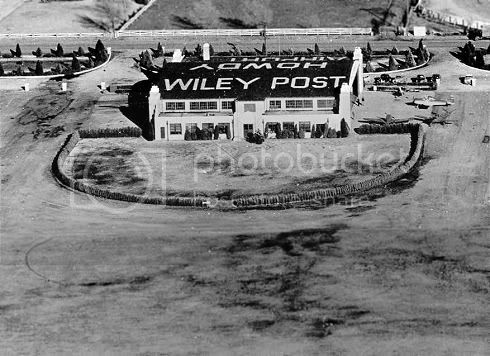 The Wiley Post Heritage of Flight Center with the Curtiss-Wright Wiley Post Hangar, will become an active aviation event center for promoting General Aviation and to further the Legacy of Wiley Post. The Hangar will host type-shows, fly-ins, conventions, exhibitions and trade shows. The completed Hangar is the first phase in the development of an aviation adventure which will include several aviation and transportation museums all under one roof; a 1920's -30's style air terminal, flying airplanes, fly-in hotel, dinning, shopping and an adjacent golf course. An interesting tidbit: Beverly Osborne’s Oklahoma City based Chicken In The Rough restaurants and franchise was one of Wiley Post’s sponsors, and a new Chicken In The Rough diner will be in the new facility! But, that's another story! 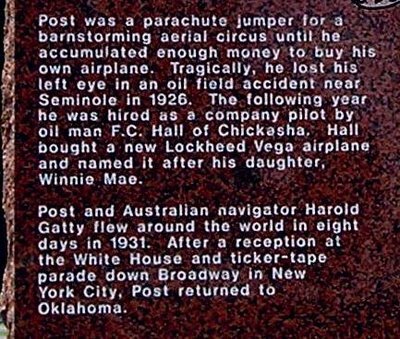 This one’s about an Oklahoma City hero, Wiley Hardeman Post. 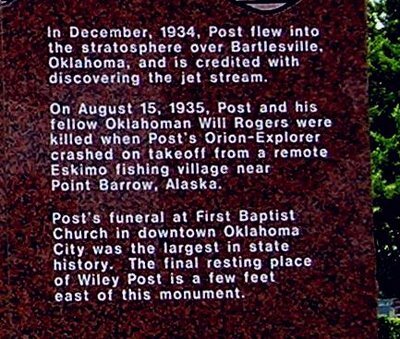 Wiley Post is buried in the Memorial Park Cemetery, immediately east of the Broadway Extension, just south of Memorial Road. You might want to visit this Oklahoma City Hero there sometime, and give him a tip of the hat, if you have a chance. It was my privilege to do that very thing this afternoon. 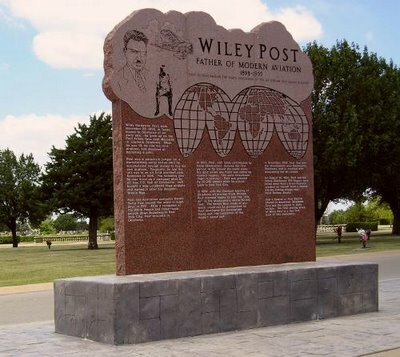 Also, see Wiley Post's Memorial. Who Is Camille Nixdorf Phelan? Around 1927 she decided to make a quilt portraying Oklahoma history from 1541 the year of Francisco Vasquez de Coronado's expedition through the Oklahoma Panhandle) to about 1931. She spent two years researching the state's history, electing prominent Oklahomans and events to be sketched on fifty-four quilt blocks. She worked four year[s] stitching the outlines of the drawings with black silk thread and mbroidering the details in pastel colors. After exhibiting her quilt at the 1933 Chicago World's Fair, Phelan donated it to the Oklahoma Historical Society in 1935. Mrs. Phelan (I’m just guessing, but I doubt that she’d care to be referred to as "Ms.") died in Oklahoma City on July 28, 1946. Nearly sixty years ago Camille Nixdorf Phelan presented to the Oklahoma Historical Society a quilt that portrayed events and personalities of Oklahoma history in embroidered pictures. Since then little has been written about Phelan or other needlework she created. After several years of research, during which she also located another important Phelan quilt, Dorothy Cozart details the life and work of an artist who painted with needle and thread. My main object in making this pictured history and in presenting it to the Oklahoma Historical Society is the fact that in most of the published records of this formative period, the sordid and rough element has been exploited to the exclusion of the cultural and artistic. I want to counteract this influence by depicting the better element and to leave to posterity a record that will show the spirit of patriotism that motivated the great characters who made up the unique commonwealth Oklahoma. And I want to express my own appreciaton of the 'Land of the Mistletoe,' one time domain of the proud Red Man and the inspiration of those sturdy pioneers, the 89ers, many of whom have already crossed the border in their last great run. The presentation of this priceless gift to the Historical Society was made an historic event. A splendid banquet was given on the night of November 30, 1935, at the Biltmore Hotel in Oklahoma City. Guests were present from many parts of the state. Some of them were men and women who had been identified with Oklahoma history for many years, while others were descendants of those sturdy pioneers who contributed to the founding of our state. Governor E. W. Marland accepted the quilt on behalf of the Oklahoma Historical Society and the State of Oklahoma. Was this lady proud to be an proud Okie? You betcha! So, rememember her name (yes, there will be a test later on)! NOTE: This post has been majorly updated by THIS ONE which contains everything here but a lot more. I've left this one here for historical purposes. Also, this article is complemented by a later article which draws upon First National's Archives. Very few of us, if any, were alive during the "Great Race" (1930-1931) to finish 2 skyscrapers in Oklahoma City, the First National Bank and the Ramsey Tower. The Ramsey Tower (now City Place) won the race by a hair on October 3, 1931. Until the early 1970's and before, these two structures were the "signature" of downtown Oklahoma City’s skyline. Following the "Oil Bust" in the early ‘80s and with the resulting July 5,1982, collapse of Penn Square Bank in Oklahoma City, many other "main line" banks fell in harm’s way, including the First National Bank, theretofore the state’s largest bank. Thereafter, notwithstanding its fine art deco grandeur, the First National Center entered into decline. "The Beacon Club", a prestigious private club which occupied the top 3 stories, moved to the Oklahoma Tower in 1997 ... http://www.beaconclub.com/. The club's history is presented here, http://www.beaconclub.com/history.php. The 1st National Center has languished badly since the 1980's once you higher than the 3rd floor. "Plans are to bring it back to its former glory as the crown jewel of downtown Oklahoma City. To fill it up – and dress her up and take her to the ball. Have a centennial ball in the Grand Banking Hall." See http://www.okctalk.com/okc-metro-area-talk/6387-first-national-center-sold-big-plans.html for much more about that. Wouldn’t that be grand! Hopefully, you’ll be able to attend a Centennial Ball in that Great Banking Hall, dark and unaccessible for years, seen below when the lights were still on. Yeah, I know I've got the city names transposed, but that's my choice. The Hornets were a smashing success in Oklahoma City last season, selling out the 19,163 Ford Center in 18 of 36 home games, averaging 18,718 overall, which would be 9th out of 30 NBA for Oklahoma City-only home games. Not too shabby for an NBA novice wannabe town! The Ford Center is a fully-paid for arena paid for by a city sales tax (MAPS) and is owned by the City of Oklahoma City. When walking to the arena at night from parking south and west of the Ford Center, this is what you see. Inside the Ford Center, this is always what you see, day or night, when the Hornets are on the court ... but if you can get better seats than the cheap seats, where this pic was taken from, that's even better! Of course, I'd be remiss if I didn't mention the Honeybees! Here's a sample ...and, yes, it was (ahem) overheard that the old geezer sandwiched between these lovelies, as this pic was taken, said, Thank you, God! Are you an Oklahoma City oriented person who wants to talk about this thrilling experience which has graced our city? If so, there is no better place to discuss any apsect of Hornets basketall than in the Oklahoma City Hornets Central Forums, http://www.hornetscentral.com/forum/index.php. It gets a little rowdy at times (several New Orleans-oriented posters there make it interesting), but it's always fun! If you've not visited HornetsCentral, doing so should really be a "must do" item on your future agenda! You won't be disappointing, and it's free! This is my initial foray into blogging stuff ... it will take me a little experience and time to get it right! But, I'm hoping that you will find something of value in Doug Dawg's Blog, hopefully not only later, but sooner! As I bounce my way around the walls of learning blog-ropes, I'd value your comments and suggestions in making this a good place to be for those who are interested in Oklahoma City from a historical perspective, whether the "history" be past, present, or future. Yes, I know that only "past" is thought of as "historical". But, let's bend the term just a little and see "what is" as well as offerings on the table as to "what might reasonably come to be," based on present information at hand! I very much doubt that I'll get into issues of "who's right, who's wrong," here. That's beyond the scope of what I want this blog to be. I'm absolutely not a guy who is "in the know" ... I'm an outsider looking at facts and I have no clue about what might be in the minds of the movers and shakers of this community other than what I read in the funny papers. And, frankly, that's not my type of thing, anyway. I care less about that than what I see ... in Oklahoma City's past, present, and, possibly, future (as long as it has some past or present root in some factual information). My intention with this blog is not to persuade, dissuade, criticize or critique anyone. It is merely to present information, most often graphical information, about Oklahoma City. Consider it to be a picture book with not too many words ... well, this wordy initial post doesn't bode too well for what I just said! I'll certainly be engaged here with the Oklahoma City/New Orleans Hornets for as long as "Oklahoma City" is at least a part of the descriptive name of the team! The Horents are and have been (at least for me) the most electric happening to my town beginning with the September 2005 announcement that we'd temporarily host that NBA team, and, for me, that remains true to this day, and, I'm sure, will remain so until April or May 2007 at which time the Hornets may depart my city and return to Cajun Country. If so, and after that, what of the NBA's presence here? Who can say? Certainly, not me. But, the NBA's presence here will certainly receive its fair share of attention in this blog. Beyond these initial thoughts on this day, the birthday of Doug Dawg's Blog, I have no clue where it may go, if anywhere. I will take it where it will go without any roadmap in hand. It may wind up in the toilet, but then again, who can say ... it may fare better than that. At the least, I will attempt to make it an adventure! Anonymous comments are allowed and I've decided to allow comments without my prior moderation — that will change if vulgar and/or spam comments are made. If you're not seeing the panel to the left of this column, that's because you are using less than a 1024 x 768 px display ... which is used in this blog for best viewing. I've also noticed that pages containing lots of images, as most of mine do, load more quickly in Firefox than in MS Internet Explorer. 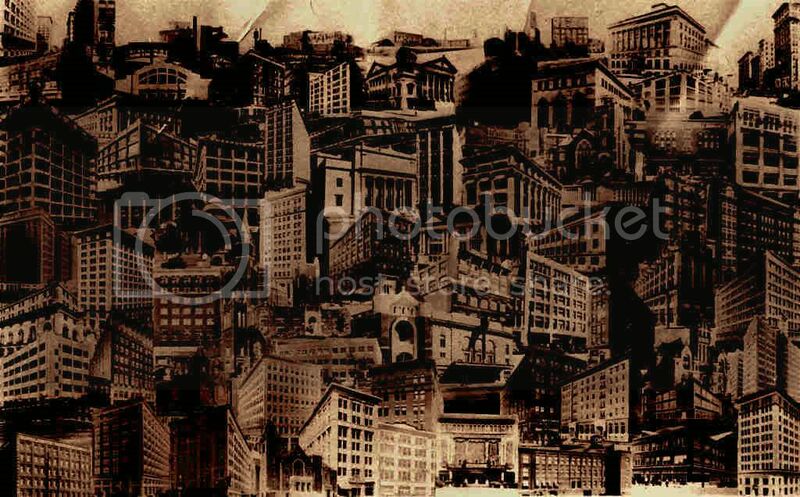 If you're curious about what the hidden background image looks like, click here or if you want to know a LOT more about the image, click here. Click a button below to open an Index page. These and other quick links are also in the the left pane. You Can Also Search Doug Dawgz Blog ... use the Search box at the left for great search results. Anonymous comments are allowed but I'll moderate all comments. [Ed note: as of 8/29/09, I'm experimenting with no longer moderating comments. Hopefully, the experiment will show that no need to moderate comments any longer exists.] If you're not seeing the panel to the left of this column, that's because you are using less than a 1024 x 768 px display ... which is used in this blog for best viewing. After clicking on a link below, click <<"Home" at end of a post to return here. Most Substantial Recent Updates: First National Center, updated through March 25, 2008 ... announcements and concerns but no Grand Banking Hall, yet. This initial article was substantially complemented in this second article drawing on images from First National's archives. Beverlys Chicken-In-The-Rough. This file was substantially added to on 2/21/2008 to include more pics and an updated history of Beverlys ... which post, by the way, receives the most "hits" of any blog article I've written. Beverlys obviously strikes the chords of a heck of a lot of people around the country.